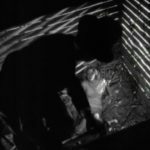 This post was written as part of the Dana Andrews blogathon being hosted by Classic Movie Man. While the temptation was to write about one of Andrews' more career defining film noir roles I chose The Purple Heart because it comes at an interesting point in the career of Dana Andrews before he achieved his greatest stardom. As the article will reveal even Andrews himself came to consider The Purple Heart the movie which made him a top Hollywood star. From the Oscar-winning director of the poetic classic of pacifism All Quiet on the Western Front (1930) comes the, by comparison, heavy-handed World War II propaganda flick The Purple Heart . The earlier film is an indictment against war made all the more startling by being told from the viewpoint of the enemy. The Purple Heart is a call to arms against a monster. Perhaps this is the difference between reflecting upon the horrors of war past versus living through a World War in the then and now. Dana Andrews is the ranking member of a group of eight downed American fliers being tried for murder by the Japanese. Yes, the charge is murder and the trial takes place in a civil court, though the opportunity to be moved to a military camp and treated as soldiers is offered in exchange for information. The only information the Americans offer are the standard name, rank and serial number. The Japanese response is torture. Will the Americans talk? 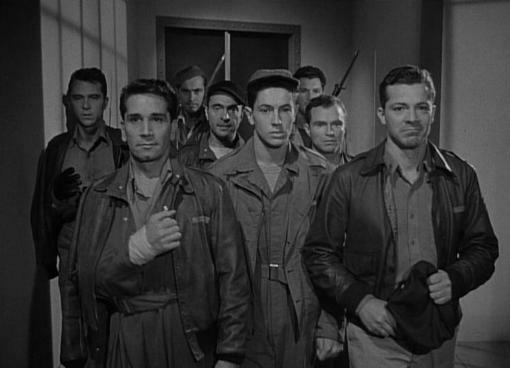 Besides Andrews as Captain Ross the American soldiers being tried are played by Richard Conte as Lieutenant Canelli, Farley Granger as Sergeant Clinton, Kevin O'Shea as Sgt. Skvoznik, Red Barry as Lt. Vincent, Sam Levene as Lt. Greenbaum, Charles Russell as Lt. Bayforth, and John Craven as Sgt. Stoner. The Purple Heart presumes to tell the story of missing members of American B-25 crews in the aftermath of the Doolittle Raid on April 18, 1942. Sixteen U.S. Bombers were involved in the raid, launching from the very same USS Hornet aircraft carrier that Dana Andrews has nightmares about in The Purple Heart. After successfully hitting their targets all sixteen bombers were lost, though most of the crewmen (67 of 80) survived. While those losses may not sound rosy, the Doolittle Raid was a huge success in proving that American bombers could strike Japanese targets. Prior to the raid it was thought that Japan was too isolated to be penetrated by American bombers. Coming just a little over four months into the war the Doolittle Raid would also cause the Japanese to make tactical changes which would eventually cost them in battle, specifically at Midway, and turn the tide on the Pacific front of the war. The eight men on trial by the Japanese. Dana Andrews standing. In mid-August 1942 the U.S. learned from the Swiss Consulate General, represented by Keppel (Torben Meyer) in the film, that eight surviving airmen were being held prisoner by the Japanese. In October the Japanese announced that the eight men had been tried and sentenced to death, though several of them had had their sentences commuted to life imprisonment. This is what producer Darryl F. Zanuck, who also wrote the original story for The Purple Heart under the name of Melville Crossman, had to work with. The fate of the real U.S. soldiers would not be known until after completion of the war. The Purple Heart is an imagining of their trial. 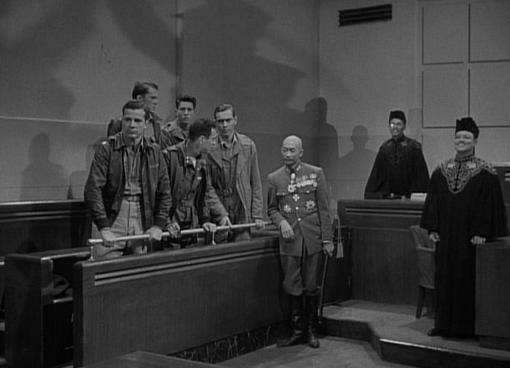 Much of the film takes place in the Japanese courtroom with scenes in between the trial taking place in a barren jail cell bugged by the Japanese. Torture occurs off-camera with results shown afterwards. The Purple Heart is almost like a modern slasher film in that none of the Americans are made to suffer in the same way. As each soldier is taken away for questioning the other men and the audience are left to wonder what terrible things are being done and what handicaps each soldier will possess upon their return. I'm still not really sure what they did to Bayforth. Let's just hope he wasn't a piano player. An early flashback does a convincing job of imagining the original mission from its last few moments in the air to the men locating each other again on the ground. Today The Purple Heart arouses some controversy over its portrayal of the Japanese. There were no such concerns in its own time and place where it was both a critical and popular success. The Purple Heart began filming in the Fall of 1943 and was released in February 1944. We were at war with the Japanese and Japanese Americans were being detained or interred in various camps or centers in America at this time. The Purple Heart was not made for them. 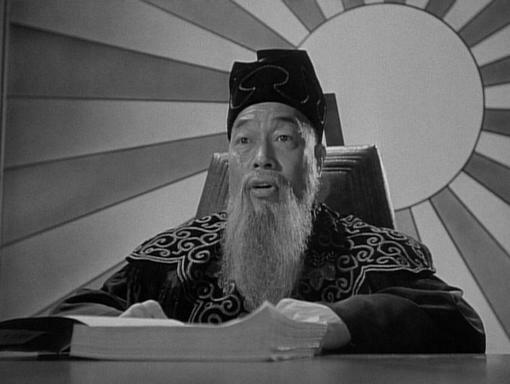 Moy Ming, a Chinese born actor, plays the Japanese Judge. The advantage to watching The Purple Heart today is that we have more facts than they had then. We know the fate of the eight downed airmen. The advantage to sitting down in a theater to watch The Purple Heart in 1944 is that we can only imagine what really happened and the facts presented at the heart of the film are pretty believable even in retrospect. The 1944 theater patron was shown the courage of the American soldier contrasted with the treachery of the enemy. And Zanuck and company make sure that the Japanese are plenty treacherous! 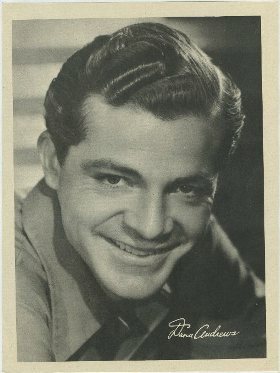 Dana Andrews had been in Hollywood for four years and despite having already appeared in high profile films such as William Wellman's The Ox-Bow Incident and previously for Milestone in The North Star, it was The Purple Heart which made him a star. 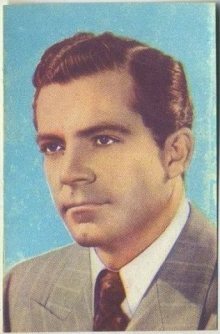 Both existing Andrews biographies refer back to a 1958 interview Andrews recorded in which he recalls 20th Century Fox head Spyros Skouras telling him as much. His Captain Ross of The Purple Heart had stuck a chord with women across America who projected all of his finer qualities, and he had no others, upon their own husbands who were off fighting the war at that time. Andrews seemed startled that women had taken to a film with no meaningful female characters in it, but the reception he received at a Philadelphia stopover to promote another Fox film convinced him it was so. (McKay 57, Rollyson 142). 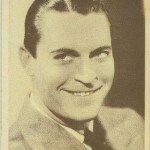 Andrews cemented his stardom before the year was out starring with Gene Tierney in Otto Preminger's Laura and then had a very successful 1945 in which he appeared in the musical State Fair; again for Preminger in noir thriller Fallen Angel; and then back to Milestone for a third time in the better remembered war film, A Walk in the Sun. Besides Milestone A Walk in the Sun also reunited him with Canelli of The Purple Heart, Richard Conte. Milestone gets the best out of Andrews as a man who leads by example. Andrews is quiet and virtuous, displaced by war from America's heartland and possessing all of its values. Ross is honor bound not to reveal to the Japanese where his bomber came from and he does not budge from this oath no matter what General Mitsubi threatens. Leniency is offered in exchange for this information. Andrews, as Captain Ross, still isn't telling. When Corregidor falls, in a scene highlighted by the courtroom breaking into a celebration highlighted by mock sword fights and dancing, Mitsubi believes he finally has the leverage to extract the information he needs from the Americans. Mitsubi tells Ross that, "It is a wise man who knows where courage ends and stupidity begins. General MacArthur abandoned Corregidor when he saw defense was useless. That is clever. You insist upon protecting the carrier from which you came when it no longer needs your protection. That is stupid." After Corregidor falls--note the shadowy swordplay on the wall behind the soldiers. Dana Andrews looks him square in the eye and remains a rock, his Ross responding, "General MacArthur has his orders, we have ours. I'm sure he found his orders as difficult to obey as we find ours." 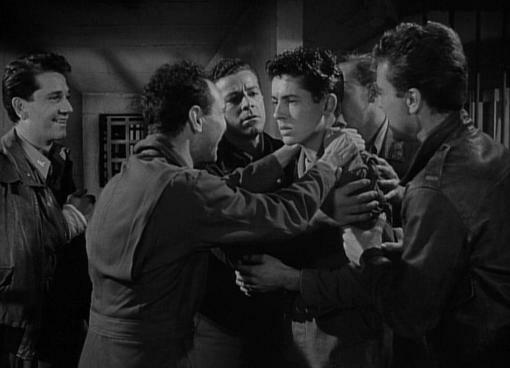 Besides Andrews other standouts in The Purple Heart include 18-year-old Farley Granger in only his second film following his previous teaming with Milestone and Andrews in The North Star; Conte as the fiery Canelli; Levene as Greenbaum, empathetic father-figure to Granger's Clinton; and Richard Loo, who is evil incarnate as General Mitsubi. Mitsubi has vowed to the court to extract details of the mission from the Americans or suffer a very final self-imposed penalty. 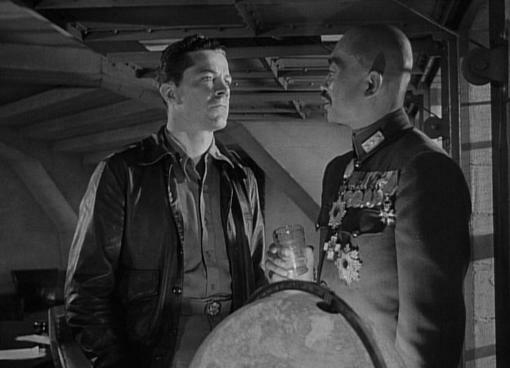 Ross (Dana Andrews) is called in to talk privately with Mitsubi (Richard Loo). Agreement was not reached. As previously mentioned The Purple Heart was a huge hit with American moviegoers in 1944. There is only the one scene flashing back to the men on the ground, otherwise The Purple Heart keeps itself confined to the courtroom, its surrounding offices and holding cell. It is an effective cross between courtroom drama and horror film. There is suspense throughout from wondering which, if any, of the Americans will prove to be Mitsubi's weakest link to a morbid curiosity of what type of damage the Japanese will inflict upon the next soldier that they question. Clinton (Farley Granger) returns from questioning. Did he talk or didn't he? Wait, is he okay? He looks okay. What did they do to Clinton!? Finally, there seems to be an offer made that cannot be refused and a private meeting between the Americans to decide whether it should be taken. "It's not majority rule. It's one for all and all for one," Ross says as we move towards the count of a secret ballot and final verdict of the Japanese court. In his glowing New York Times review Bosley Crowther does take time out to mention that "Whether the facts of this picture are documented to the last detail, whether it records actualities, are matters not yet fully revealed. We must wait till the war's end, most likely, to know the real story it assumes." 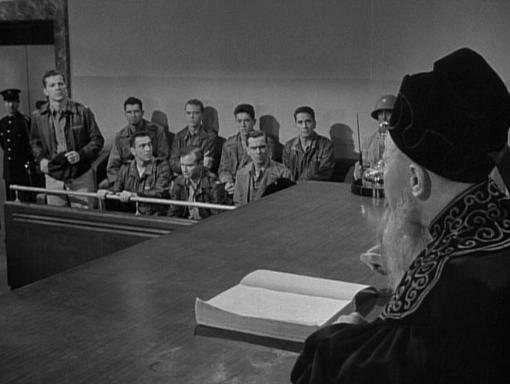 Overall the real men fared better than their counterparts on film: Three were executed after completion of the trial, one died in confinement during the war, and the four others survived long beyond it. You'll have to watch The Purple Heart to learn the fate of Zanuck and Milestone's film characters. Richard Conte, left, and Dana Andrews, right, lead the way out of court with Farley Granger just behind and in between. Crowther, Bosley. "The Screen." The New York Times 9 Mar 1944. The New York Times Archive. Web. 26 Jul 2012. McKay, James. Dana Andrews: The Face of Noir. Jefferson, NC: McFarland & Company, Inc., 2010. Rollyson, Carl. 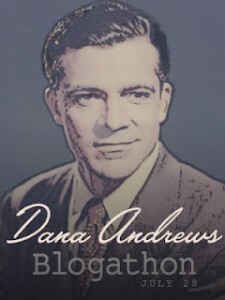 Hollywood Enigma: Dana Andrews. University Press of Mississippi: 2012. I have to point out the McKay’s book is not a biography, and, in fact, the biographical section of his book is full of errors. 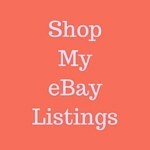 But McKay otherwise is a very useful resource. He is a good guide when you are watching films like The Purple Heart, which, by the way, still brings tears to the eyes of Dana’s daughter, Susan. In this film, Dana patented his brand of noble hero, a man who knows how to lead while respecting the individuals in his crew. I think the film still holds up in many ways, and for all its faults, it does convey certain essential elements of the American character. Hi @twitter-35048855:disqus thanks for commenting and thanks for the correction on the McKay book–definitely looked more like a “Films of” type selection. To be honest I found the required excerpts online, but thanks to a nice Amazon price, a hard copy of your own biography is on its way here now. I agree, I enjoyed The Purple Heart and Dana’s performance was one of the key reasons why. My favorite bit was probably the one I quoted above with his response to Richard Loo after the courtroom celebration when Corregidor fell. He really seemed to put a damper on that party for Loo’s General! Cliff, please let me know what you think of my biography when you read it. Dana has so much dignity in The Purple Heart. Dear Cliff, thanks for participating. You just made it under the wire too! The Purple Heart was one of the first Dana Andrews movies I remember seeing as a kid. Pretty heavy stuff, but I loved WWII movies. As an adult it’s enjoyable to watch the performances and see the Dana Andrews mystique start to develop. His solid, upstanding character really comes through in this film. Great job, Cliff. Thanks so much for keeping me in the loop throughout @google-8cc904175209076b9863071c08ba92fe:disqus. War movies aren’t my favorite genre and I haven’t written about many here, but then this wasn’t your typical war movie. Dana joined several actors and actress on whistle stop tour promoting Zanuck’s Wilson, and Dana was amazed at the crowds, especially women who cheered him for his work in The Purple Heart. I was looking for a news clipping about that Wilson tour, but ran out of time before I could dig one up. Loved the story about it though. Thanks, Jacqueline, very happy you enjoyed the post! Zanuck is a big reason I love the pre-code stuff from Warner Brothers so much. 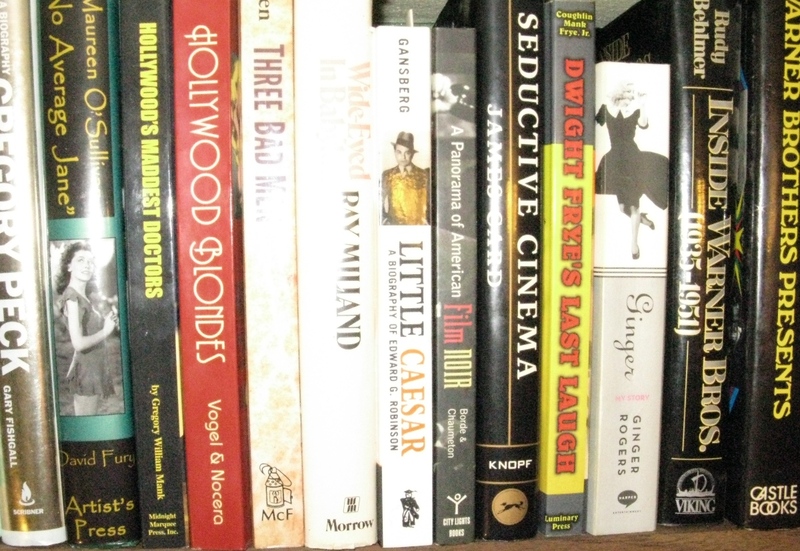 The “Twentieth Century’s Fox” biography of him by Custen is a good one to pick up for dirt cheap used at Amazon. Thanks, Kristina! I do find it fascinating to reflect upon those exact moments in time and in this case to think about how the movie couldn’t have possibly been made any earlier and just how very different it would be if made any later! 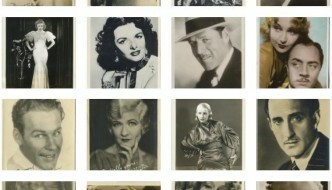 That Melville Crossman one seems to crop up most of all. This great post had me adding THE PURPLE HEART to my queue before I even finished it. Thanks! Great, Paula, I hope you enjoy it!